Picture - Shylock After The Trial. The vengeful, money lender runs away from a group of sneering children. "The Merchant of Venice." This section is dedicated to The Merchant of Venice, the play by William Shakespeare. The picture is 18th century and image displayed represents the essence of the play which, we hope, will bring to life a famous scene or character from the play. The information provided in this section of william-shakespeare.info includes famous quotes / quotations from The Merchant of Venice, summary of the plot or story, facts about the play, a list of the cast and characters and access to the full text - script of The Merchant of Venice by William Shakespeare. The plot involves a vengeful, greedy creditor, Shylock, a Jewish money-lender Shylock who seeks a literal pound of flesh from his Christian opposite, the generous, faithful Antonio. Shakespeare's version of the chest-choosing device revolves around the play's Christian heroine, Portia, who steers her lover Bassanio toward the correct humble casket and then successfully defends his bosom friend Antonio from Shylock's horrid legal suit. Shylock, is a Jew whose beloved daughter is lost to him when she elopes with a man who belongs to a virulently anti-Semitic society. When grief, anger and vengeance overcome common sense he ends up literally forced to his knees to renounce his faith and his fortune. It is believed that The Merchant of Venice was first performed between 1596 and 1597. In the Elizabethan era there was a huge demand for new entertainment and The Merchant of Venice would have been produced immediately following the completion of the play. It is believed that The Merchant of Venice was first printed in 1600. As William Shakespeare clearly did not want his work published details of the play would have therefore been noted, and often pirated without his consent, following a performance. The quotes from The Merchant of Venice are amongst Shakespeare's most famous including 'All that glisters is not gold' and 'Mislike me not for my complexion'. Details of these famous quotes follow, complete with information regarding the Act and the Scene, allowing a quick reference to the section of the play that these quotations can be found in. Please click here for the full text of the script of the play. The Jew of Malta by Christopher Marlowe (1564-1593) In this play, the main character, Barabas, is so detestable that his enemies boil him in a cauldron. Audiences loved the play, many of them not realizing that Marlowe’s main intent was to satirize Christians. The play enjoyed a revival four years later and it probably influenced Shakespeare in his depiction of Shylock. In Shakespeare’s time, English law continued to forbid Jews from living in England, but a few hundred survived in London and other cities in the guise of Christians. 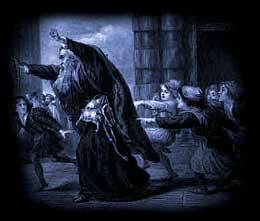 Anti-Semitism in England increased in England around 1190 after non-Jews borrowed heavily from Jewish moneylenders. King Richard I (reign: 1189-1199) put a stop to Jewish persecution, but it returned in the following century during King Edward I's reign from 1272 to 1307. The government required Jews to wear strips of yellow cloth as identification, taxed them heavily, and forbade them to mingle with Christians. In 1290 Edward banished them from England. Only a few Jews remained behind, either because they had converted to Christianity or because they enjoyed special protection for the services they provided. In Shakespeare's time 300 years later, anti-Semitism remained in force in England. The Merchant of Venice inspired Dustin Hoffman to take the role of Shylock on the London stage.